It is one of the biggest strikes in China for decades and has attracted international attention. The strike at factories owned by Yue Yuen Industrial Holdings in the Dongguan township of Gaobu is already one for the history books. Dongguan is in Guangdong province, which accounts for more than a fifth of China’s exports. The ruling ‘Communist’ Party (CCP) has been understandably nervous about such a massive protest, and the risk of a ripple effect. The strikers, up to 50,000 at one stage, demanded back payment of millions of yuan in unpaid social insurance and pension contributions. Yue Yuen claim the direct losses from the strike are US$60 million. This shows the economic power of workers. The increase in social security costs and subsidies for the entire workforce will increase by US$31 million, which is just a small proportion of the profit of the company in 2013, US$435 million. An opaque and confusing welfare system allows companies across China to scam workers by evading their legally required payments. A month ago, workers discovered that Yue Yuen was basing its contributions to workers’ social security funds on their basic salary, rather than on their full pay, which in China includes many hours of overtime. Workers also discovered the job contracts issued by Yue Yuen are not legally valid. They demanded these and several other abuses be rectified; also crucially demanding the right to form their own union and no punishment of strikers. Yue Yuen makes one-fifth of the world’s sports shoes for global brands like Adidas, Nike and Timberland. A strike of this size and duration – lasting more than two weeks – is exceptional and all the more noteworthy in a country and political system where strikes are illegal and routinely repressed. True to this pattern, workers report that Yue Yuen bosses have engaged in strong arm tactics aided by several hundred police and riot police in order to end the strike. The Chinese regime has over decades refined a “carrot and stick” approach to defuse mass protests. In this case too the company – prodded by the authorities – has made some limited concessions to the workers combined with a strategy of threats and force. 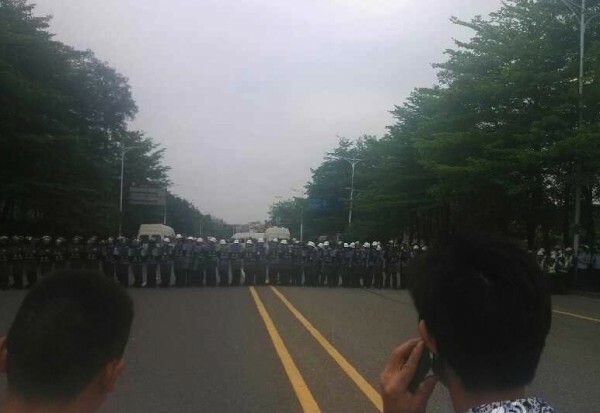 “After authorities ordered [Yue Yuen] to ‘rectify the situation’ and it made small concessions, scores of strikers were detained by police, workers said, adding key demands remained unmet and they only returned because of intimidation,” reported AFP on 29 April 2014. “We don’t trust the government or management any more, so we are waiting for the money to show up in our accounts before we go back to work,” a worker told Radio Free Asia. Workers complain their social security accounts are not transparent, a fact that allowed Yue Yuen to cheat them in the past. Despite the repression there are unconfirmed reports that a minority possibly numbering several thousands of workers are still on strike. Yue Yuen management announced its plants were “fully operative” on Monday 28, April, but AFP’s report, based on reports from several workers, said that “about four-fifths” had returned to work. There are reports of discussions among some of the strikers to continue their struggle at least until May Day. There is great anger among the workers that despite the responsible and peaceful tactics they have pursued during the strike, they have faced repression from the outset. Police made a number of arrests and perhaps dozens of workers were injured in clashes in the early days of the strike, which first broke out on 5 April, to resume on a larger scale on 14 April when a management offer fell far short of workers’ demands. Throughout the struggle there has been a heavy presence of police and special riot units. “The ones who shout slogans get taken away,” a worker called Luo told the BBC last week. “We don’t even dare to think about banners!” At a demonstration on 15 April, workers holding banners were targeted by police for beatings and arrests. After this demonstration the factory compounds were cordoned off by police to prevent strikers taking their struggle to the streets. Last week, as the company stepped up its strike-breaking measures, workers reported being locked inside the factories (in other countries it is more normal for the employers to resort to “lockouts”). Electronic card readers used to clock in and out were removed to make it possible for the company to evade its legal liability to pay compensation if it carried out its threat to dismiss striking workers. Workers were given a three day ultimatum to return to work or face dismissal. Police were stationed inside the factories, making arrests of workers who continued to strike. “We have no choice but to go back to work. What can you do if a man with shield, baton and helmet is standing next to you?” a striker told China Labour Bulletin (25 April 2015). The CCP dictatorship presents ‘two faces’ when confronting challenges and especially movements of the masses. In Beijing, the Ministry of Human Resources and Social Security ruled last week that Yue Yuen was guilty of “wrongdoing” in failing to pay the legal amounts into workers’ insurance and pensions accounts. But as workers have pointed out, the local organs of government have for years colluded with the company, which is the normal pattern in China, turning a blind eye to abuses in exchange for tax revenue and kickbacks. Yue Yuen’s Executive Director George Hong-Chih Liu stated throughout the dispute that the local government was “fully supportive” of the company’s offer to the workforce. The actions of the police – the ‘core’ of state power – leave no doubt which side they have supported during this dispute. No arrests have been made of Yue Yuen management, despite the company being found to have broken the law. The regime is balancing between the need to maintain ‘stability’ by ending the strike as quickly as possible, and the fear that even more manufacturing industries will shift production from China to Bangladesh, Cambodia and other lower-wage economies as labour costs rise. The Yue Yuen strike is a landmark in the recent history of labour struggles in China. It began with around 1,000 workers on 5 April, but then spread to possibly 50,000 by the following week, including frontline workers and some layers of management. On 18 April, the strike spread to a second province, Yue Yuen’s factory in neighbouring Jiangxi. As in the strike wave that swept the motor industry in 2010, the Yue Yuen workers have rejected the last minute intervention of the regime’s puppet union, the ACFTU, and called for the right to form their own union. The Economist’s correspondent reported workers at the factory gates tearing up copies of a letter from the official union, which called for workers to end the strike and acknowledge the company’s “sincerity”. 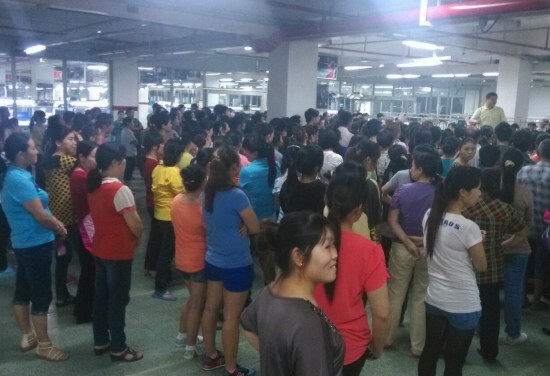 Yue Yuen workers have been clocking in but refusing to work. 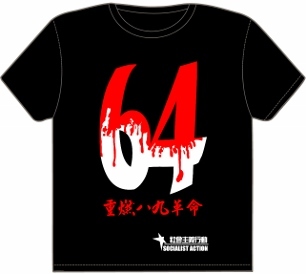 The conditions of one-party dictatorship, with a further increase in repression under CCP chief Xi Jinping, mean that strikes do not develop as they would in capitalist countries where workers have won union and democratic rights (although in many cases these hardwon rights are under attack). There are no genuine unions, no union meetings, no voting on resolutions or structured discussions over demands – workers’ struggles such as those in Dongguan develop in a largely spontaneous fashion and undergo constant improvisation. Because spies of the regime, or the company, are likely to intercept and break up the first signs of organised action, workers’ struggles tend to be spontaneous eruptions. Having started however, strikes acquire a more organised character although this is still far more difficult to sustain in conditions of illegality and ever-present repression. “This strike was spontaneous and not well organised. We can even say [the strike is] not planned by the workers but launched by the workers,” explains Chai Xiaoming, a commentator on labour issues at Peking University’s Further Education Project. “But workers still keep the high confidence… So it’s quite militant,” he told TRNN news. 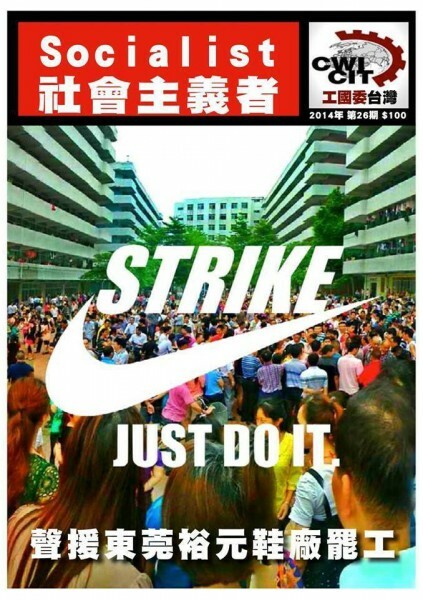 As we have seen in other strikes and mass struggles in China, such as anti-pollution and land protests, the workers have used instant social messaging groups to discuss the strike and their next moves. Some of these chat groups include up to 400 workers. These online forums are frequently penetrated by the security forces and closed down, but new ones are started. In a dictatorial system, mobile and social media provide a certain ‘shelter’ for workers and activists to meet and discuss. The workers called for the right to elect their own representatives, a right that exists on paper – within the framework of the state-controlled unions – but is rarely recognised in practise. Guangdong is often paraded by advocates of ‘reform’ as an example of progress, with the provincial government even moving to legalise collective bargaining. But in a dictatorship such ‘laws’ do not apply in reality. As this, the biggest strike for decades clearly shows the only ‘collective bargaining’ in evidence was conducted by police batons. Consequently, workers engaging in strike action are increasingly cautious about electing and sending representatives to meet management. This follows a spate of arrests of workers’ representatives even in ‘more enlightened’ Guangdong in the recent past. The most well known case is that of Wu Guijun, a workers’ representative at a Shenzhen furniture factory who is facing up to five years in prison for “causing a traffic disturbance” during a protest last year. The Yue Yuen workers have also it seems been reticent to openly pick leaders, fearing reprisals against these individuals by the company and the state. While the immediate outlook for the Yue Yuen struggle is uncertain, the strike is set to have a huge impact on the workers’ consciousness and coming struggles. “No matter if we will succeed or not, it will be recorded in history,” a worker told the BBC. It is clear the workers would have achieved nothing without the strike, even if it remains the case that the company and the government cannot be trusted to fully meet their legal obligations to the workers. The workers’ success in organising such a powerful strike despite the repression, paralysing the supply chain of multinational companies, has established a new benchmark for workers’ struggles in China and given other workers confidence. The demand for independent and democratic unions will emerge as an unstoppable force in the coming period. 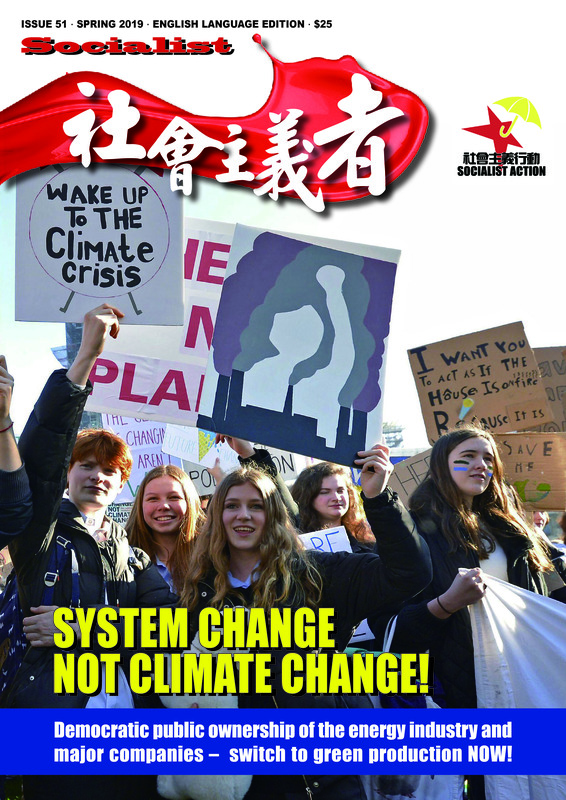 New issue of Socialist magazine published by CWI supporters.